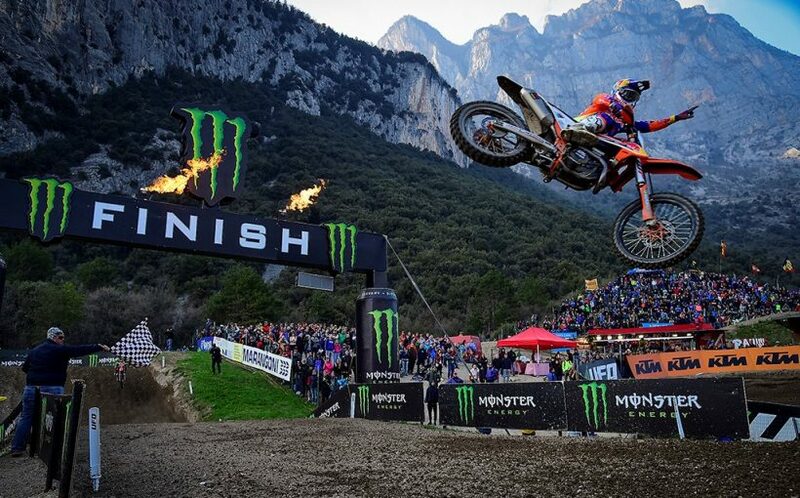 HERLINGS AND PRADO DOMINATE TRENTINO QUALIFYING. 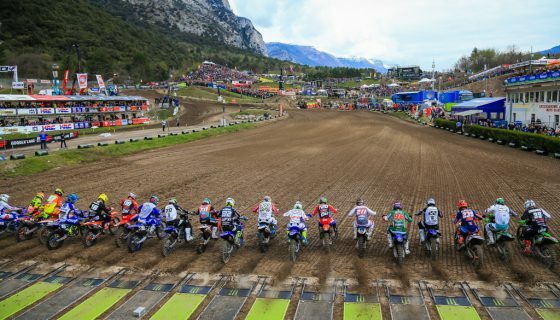 The MXGP of Trentino is well underway in the North of Italy. Today’s qualifying races were dominated by the Red Bull KTM Factory Racing riders of Jeffrey Herlings and Jorge Prado. Both rocketed to strong starts in front of the Dolomite Mountains and thousand of Italian motocross fans. With perfect weather expected against a stunning backdrop tomorrow while be even more entertaining. The MXGP and MX2 riders weren’t the only ones racing today as the support classes of WMX and EMX125 presented by FMF Racing also took on the Pietramurata circuit. WMX Race 1 was the first points paying race of the weekend and Germany’s Larissa Papenmeier took full advantage as she passed Nancy van de Ven early in the race and held off the charges of defending champion MXFONTARACING Yamaha’s Kiara Fontanesi during the later stages. Both van de Ven and KTM Silver Action’s Amandine Verstappen where able to capitalize on a last lap crash from Fontanesi respectively finishing 2nd and 3rd behind Papenmeier and just in front of Fontanesi. In the first race of EMX125 Presented by FMF Racing Emil Weckman took the lead off the start and stayed in front each of the 15 laps as Emilio Scuteri and Mieco Vettik swapped between second and third with Scuteri taking the better result of the pair. Meanwhile last round’s double race and overall winner Rene Hofer rode the pack to finish 4th. The MXGP Qualifying Race started with the early 2018 MXGP season Red Bull KTM Factory Racing superstars of Antonio Cairoli and Jeffrey Herlings at the front. 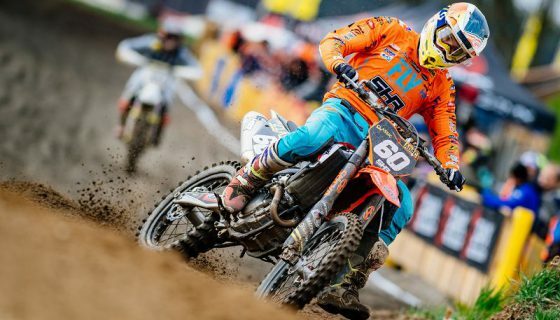 Herlings with a rare good start took full advantage passing Cairoli in the third turn. Meanwhile Team HRC’s Tim Gajser was caught in a first turn crash and had to fight his way back from dead last all the way up to 17th. 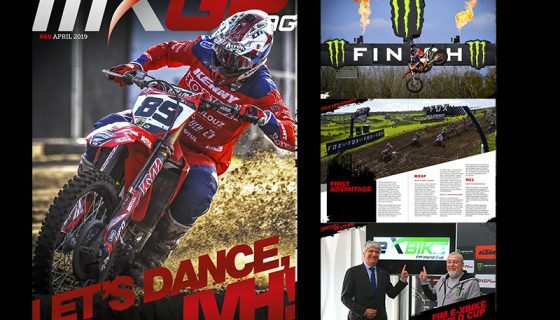 Behind Herlings and Cairoli was Monster Energy Kawasaki Racing Team’s Clement Desalle, Rockstar Energy Husqvarna Factory Racing’s Gautier Paulin, and Red Bull KTM Factory Racing’s Glenn Coldenhoff. Gebben Van Venrooy Kawasaki’s Maxime Desprey had a great qualifying performance riding in 7th the first 4 laps before being passed by Monster Energy Yamaha Factory MXGP’s Romain Febvre. Back at the front Herlings grew his lead up until the finish where he crossed the line 22 seconds ahead of Cairoli. Apart from the pass of Febvre on Desprey the top eleven riders stayed in the same position all of the 13 laps. MXGP Qualifying Race Top Ten: 1. Jeffrey Herlings (NED, KTM), 23:43.859; 2. Antonio Cairoli (ITA, KTM), +0:22.777; 3. 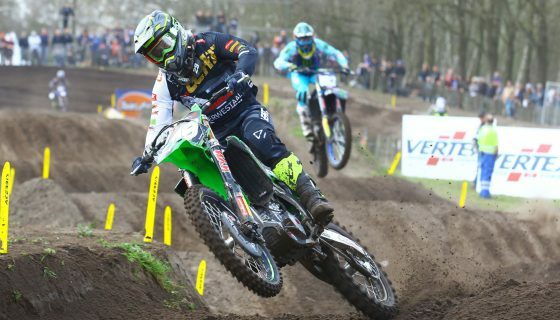 Clement Desalle (BEL, Kawasaki), +0:29.756; 4. Gautier Paulin (FRA, Husqvarna), +0:32.465; 5. Glenn Coldenhoff (NED, KTM), +0:38.808; 6. Jeremy Van Horebeek (BEL, Yamaha), +0:40.873; 7. Romain Febvre (FRA, Yamaha), +0:47.887; 8. Maxime Desprey (FRA, Kawasaki), +0:49.326; 9. Jeremy Seewer (SUI, Yamaha), +0:49.961; 10. Julien Lieber (BEL, Kawasaki), +0:57.263. MX2 Qualifying couldn’t have gone better for Red Bull KTM Factory Racing’s Jorge Prado, the young Spaniard took the lead from the start and never looked back. 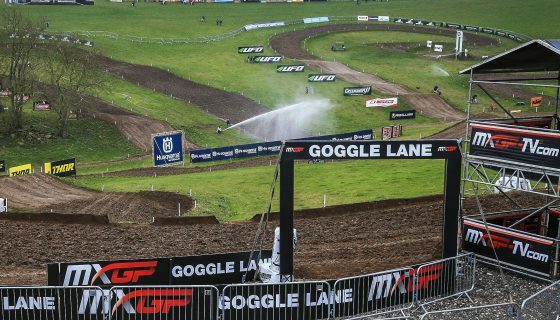 Prado first MX2 career overall win came on this very circuit last year. The #61 looked extremely comfortable today as he pulled away from Rockstar Energy Husqvarna Factory Racing’s Thomas Kjer Olsen. Prado led Olsen by just over 12 seconds up until the final lap where he backed of the pace to claim his first pole position of 2018. The first few laps of the race Hitachi KTM UK’s Conrad Mewse maintained third position ahead of STC Racing Husqvarna’s Henry Jacobi and Rockstar Energy Husqvarna Factory Racing’s Thomas Covington. On lap 4 Covington took over 4th by passing Jacobi along with Kemea Yamaha Official MX Team’s Ben Watson. 3 laps after Covington’s and Watson’s passes on Jacobi it was Mewse who came under pressure from the American and fellow Brit. Covington took 3rd from Mewse quickly but for Watson the resistance was stronger. After searching for a way past Mewse for three laps Watson made a pass stick and at the finish it was Prado, Olsen, Covington, Watson, and Mewse taking the first five gate picks for tomorrow’s pair of races. BIKE IT DRT Kawasaki’s Darian Sanayei did not start the qualifying race while Honda 114 Motorsport’s Hunter Lawrence started but only completed 5 laps. Both riders official status for Sunday is unknown. MX2 Qualifying Race Top Ten: 1. Jorge Prado (ESP, KTM), 24:28.222; 2. Thomas Kjer Olsen (DEN, Husqvarna), +0:05.820; 3. Thomas Covington (USA, Husqvarna), +0:07.221; 4. Ben Watson (GBR, Yamaha), +0:09.035; 5. Conrad Mewse (GBR, KTM), +0:16.820; 6. 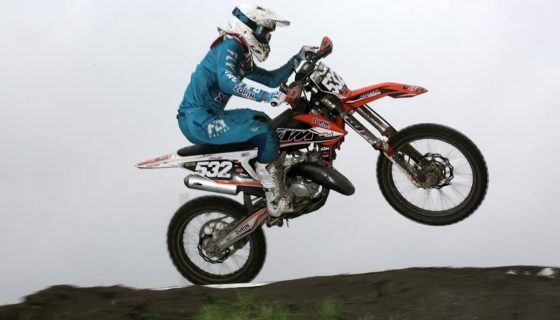 Henry Jacobi (GER, Husqvarna), +0:26.632; 7. Adam Sterry (GBR, Kawasaki), +0:30.250; 8. Ruben Fernandez (ESP, Kawasaki), +0:39.670; 9. Michele Cervellin (ITA, Honda), +0:41.294; 10. Davy Pootjes (NED, KTM), +0:45.213.